Today we had a false-alarm that South Park's rejected video-portal app hit Cydia—it was just third-party shite. But the news made us question specialty content apps: Most are worthless but a few are desperately needed. By specialty content apps, we mean iPhone or iPod Touch apps that are either portals to online content or self-contained readers and music players. Writers who can't find distribution elsewhere are publishing at the App Store, and even musicians are now finding the App Store to be an avenue for their content. We don't like it. Yes, we admire the pluck of the struggling artist, but damn if that won't end up being super confusing fast. There are currently 89 pages of book apps at the iTunes store. How about one good multiformat reader that can take all kinds of books? Can you imagine having an icon for every book you read, and every album you want to hear? Soon, one imagines, filmmakers will release video apps with just one video—better to drop that sheeit on YouTube and have it accessible via a channel that already exists. Besides distribution, the reason some of these people are doing it is revenue: You can sell apps at any price you want without a raised eyebrow (though cheaper is better), and in some cases, like that bootlegged South Park app we checked out—not recommended, btw—ads can be inserted for bonus cash flow. There are, however, cases where a content app is a totally brilliant way to go, and that's where the fanbase is already built up, and the content is already overflowing. Newspaper apps from the NY Times and USA Today make sense, and the South Park app does too—there are so many episodes and clips that an app dedicated to keeping track of your favorites and grabbing them when you want them is "almost perfect," as we said. Are there any portals you'd wish for? Hell, anything with more than four seasons on DVD would kinda make sense, though it helps when there's an exceptionally enthusiastic fanbase. These specialty apps aren't going to replace iTunes, nor will they edge out a Netflix app, an Amazon VOD app and all those other streaming delivery programs that we desperately want to see which are making their way to bigger connected devices, like Blu-ray players and TVs. How much of this will Apple (and, let's face it, AT&T) allow through the front door of the App Store? 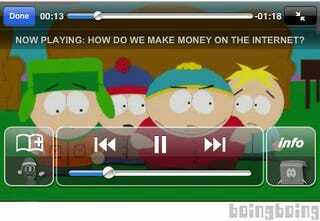 Hopefully, soon, at least as far as South Park is concerned, we'll hear some answers.